US$ 6/Month per user (billed annually). 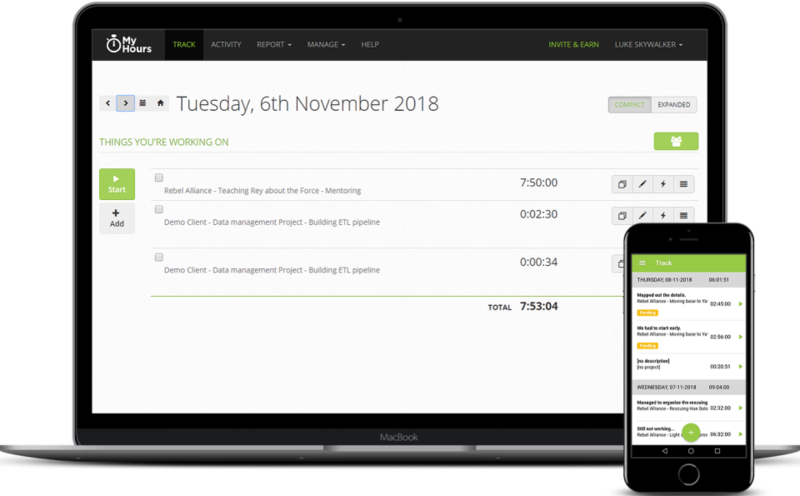 Cloud based time tracking software designed for small teams and freelancers. 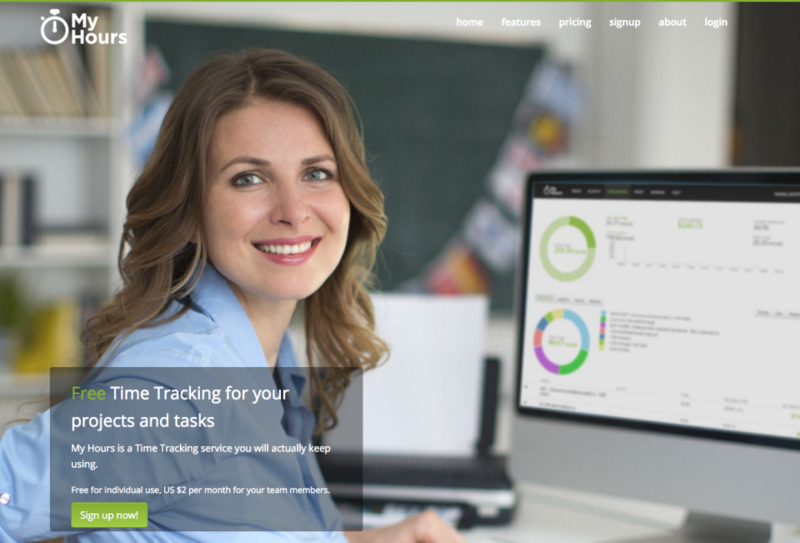 Extremely easy to use for time tracking with clients, projects and tasks. 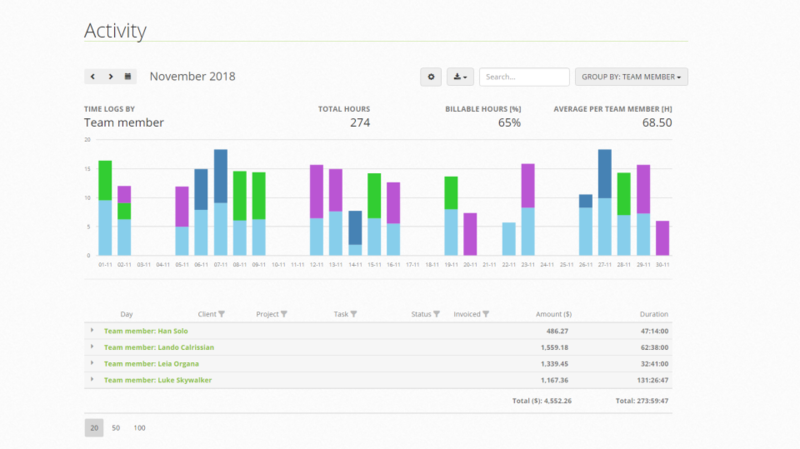 Generate insightful reports and invoices. Android and iOS mobile client apps. Bunch of loyal users since 2002! Free 30-day trial offers a full set of features, upgrade to PRO Package from 6$ per user (billed annually). My Hours Reviews Recently Reviewed! Pros: This software is simple to set up and use. I don't waste any time setting up a new project. Once I've entered the client, I just start timing and go. I usually use the free version. I don't do a lot of hourly billing in my freelance career. So, I track projects and then add up the hours to create my own invoices in WorD. This service allows me to keep permanent detailed records, and my clients know they can ask for the information if they want to review how I spend my time. If I take on more than the small handful of clients I currently have, I plan to upgrade to a paid account so I am able to generate invoices and have more clients. But for a basic user, this is the best service I've found. And I've tried them all. Note, I used to be an attorney in a small practice. I would have used this constantly in my billing had I known about it. Cons: I sometimes forget to hit start or stop because there is no window hovering over my workspace. Other than that, I honestly have no complaints. It suits my needs perfectly. Overall: This has allowed me to keep detailed billing records for a handful of my freelance clients. There is so much flexibility that I could easily use it even for flat fee projects. It is simple to set up and almost mindless to use, yet it feels very robust. I've never felt a feature is missing. After trying countless competitors, including some very expensive industry software, I'm still convinced this is the best choice. And as my business grows, there's plenty of room to upgrade and expand the uses. Also, and importantly, customer service is wonderful. One weekend, I stupidly locked myself out of my account but changing the email address to one I no longer use or have access to. I still don't know what I did, but CS responded within hours. They found my account even though none of the info I'd provided was accurate. They completely saved my weekend! And they didn't even make fun of me for the mistake! Through all my experiences, I've become a huge fan of My Hours. I'm happy to talk to anyone who is considering it. Use it as a single user and I love it! Pros: What I like most about this software is the ease of setting up projects and selecting projects for time entry. I love the different settings for time entry also, the 'standard' way and the quick mode. I also like how I can automatically assign tasks to every new project, that is so helpful! Overall, I think the architects and developers have done a great job making this software simple, powerful and easy to use! The user experience is phenomenal and I'm not overloaded with options! Cons: What I like least about this software is that it seems as though it has trouble loading sometimes and "hangs", especially when I modify a time entry. It feels like the server is undergoing maintenance and it has trouble connecting. It's not often and this hasn't deterred me from using it, but it is the first negative attribute that comes to mind. Also, I wish the software had a feature to report and track time in decimal notation. We did have a few technical mishaps in the past which is why we upgraded to a state of the art cloud hosting service. We are working hard on making your My Hours experience as flawless as possible. However, if you do notice any strange behavior or you would like to make a suggestion such as the decimal notation you mentioned, please, do not hesitate to email us at support@myhours.com. We take user suggestions very seriously and providing good support is very important to us. I have used MyHours for over 5 years. It has glitches now and then, but for free you can't complain. Pros: It's great if you don't mind getting no customer support. I suggest paying for the upgrade to see if that changes how support assists you when help is needed. Cons: Customer service is awful. I am currently attempting to switch to their new version as instructed by the company and the software won't allow it. I alerted customer service and all they can say is "Yes you can" and "Change your password". I have described my situation in detail multiple times and these are still the only solutions they offer me. with all due respect, we cannot support our old vintage version of My Hours. Users of the vintage app have been alerted multiple times that it is out of development and no longer supported. Nevertheless, we are doing our best to help you transfer your data to the new and much improved service free of charge. We thank you for your trust and long history with our product and hope you will feel at home on the new platform. If not, please, write to support@myhours.com as we take support very seriously. I've been using myhours for several years & love it! Accurate, intuitive, easy to use & great price! Pros: I used (old)myhours and have since transferred to myhours. It's easy to keep track of clients, and projects, and appreciate the report options. It helps me determine where and how much time I'm spending for each client - very helpful when billing. Always appreciate the prompt responses I receive when I have an issue or question. Have recommended myhours to many VA (Virtual Assistant) colleagues. Cons: One thing I miss from oldmyhours to the newer version is the timesheet by project report. Other than that, pretty darn happy with the program! It's great to hear from a user who migrated from our old service to the new platform. Comments: My Hours offers amazing timer functionality for anything, really. Not just projects and tasks, but anything you need to keep tabs on time and effort spent. It is great with budgeting and their reporting functions are amazing. 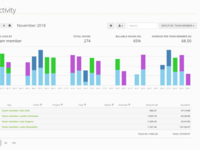 Even in the free account, you can generate amazing reports with My Hours. Pros: My Hours is perhaps the easiest and quickest way to track hours against tasks and projects. Signing up for an account is quick and easy. There are only 2 versions: free and pro. Start using the free version with unlimited project and task tracking, reports and mobile access. Great way to determine if this is what you are looking for to track time. My Hours is great if you simply just a need a means of tracking time on projects and tasks and your current project management tool is not equipped for this or you simply are not using one. Add projects and tasks quickly. Start and stop timers, along with descriptions effortlessly. View status using various filtered views and always have full visibility with metrics. Need the power to generate invoices and manage budgets? Go with the pro feature and have all these amazing tools at your fingertips. Cons: The free version displays ads. But in all fairness, what do you expect for free? Somehow a business must find a means to maintain their operations. Other than that, My Hours is straight forward. Pros: It's so easy to use and is not complicated like other time tracking pages. I can't work, I can't track my working hours without using MyHours. Cons: The interface is updated almost every two weeks. While you are tracking the time, you see a message "There is a new version of MyHours available, please reload the page", but I don't see any mayor different, and sometimes after the reload, the hours I was tracking for the day is gone, I don't see it again in the page. My point is, that updating the interface so often, is not always good. Also rarely, the page doesn't loading at all for a few hours. And if I want to see all my tracking data from the start of the year, the page is crashing. Quick and Easy to use for Freelancers. Pros: I like that this software is free, depending on your needs. It is super easy to jump right in and start using and it also offers a app for your phone. Setting up clients or certain services that you do the most, is super quick and I can send hours directly to my clients from the software. Cons: The only thing I don't like is that I have not found that it integrates with any other software, that is really my only con, but it isn't such a big deal that I would change from using it. Overall: I work as a freelancer on various projects and I absolutely love using this to track time for my clients. I would definitely recommend this software to anyone because it is super easy to use and I am able to send my time tracking directly to my clients without any extra steps. Comments: Not positive, but I can't waste the research time that would be necessary to locate and use a different time tracker. Pros: It's free and theoretically easy to use. I use it for the most basic of time tracking - I don't input projects or anything, just fill out the description box as I switch tasks. Cons: It doesn't work properly about 60% of the time. I will write in the 'description' box what I've been doing, and frequently have to add a couple of minutes as I occasionally forget to click 'Start' straight away, but as soon as I click pause to edit the time log, it deletes everything I have just typed. Every time I complain, I get told to use a different browser. I DON'T WANT TO USE A DIFFERENT BROWSER. I AM NOT THE ADMIN ON MY COMPUTER AND DON'T WANT TO HAVE TO BEG THE IT COMPANY TO SET UP A NEW BROWSER JUST FOR THIS ONE TOOL!!! Customer service keeps telling me to use Chrome instead, if I wanted to use the Chrome browser, don't you think I would ALREADY be using it??? It also frequently hangs or fails to stop properly when you click stop. Pros: Ease of use. Simplicity in design. Reliability. 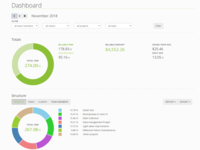 Overall: Timetracking, expenses, auditing and reporting. It's just as I wanted. Pros: It's simple, focusing on tracking time. I like the record button also. Since I go back and forth on several projects. Cons: The only thing I don't like is when I select the Project, it connects to the server to retrieve Tasks, maybe it's a few seconds, but it's very stressful to me. And when I'm tracking time, I want the "Tracked" to be sorted 'Descending' by time. I always have to scroll down and that's time consuming. 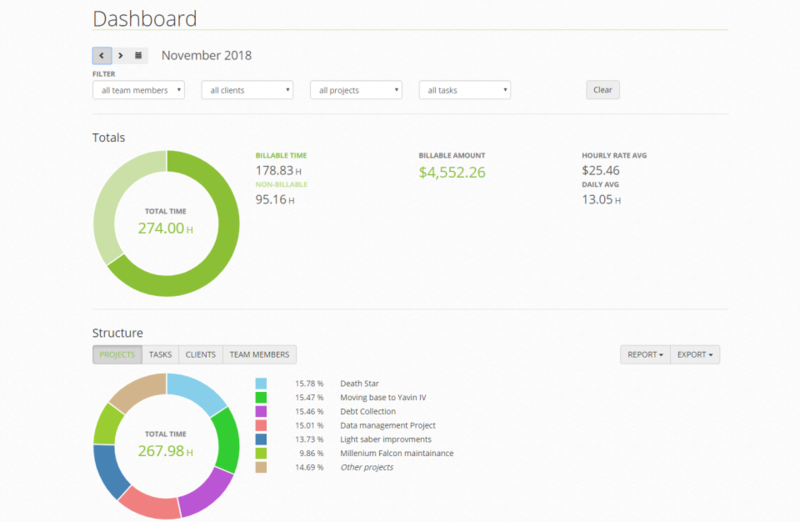 Overall: You will be able to know how much you are spending on each Projects. Please send us your suggestions to support@myhours.com as we really value user feedback and try to improve our service based on your needs. The site worked great for a while but recently has been slow in a key area. Pros: Makes it easy to track time spent on various tasks. Very clean website on the tracking page and is able to generate graphs that summarize your week or month nicely. Cons: The section to add projects has become incredibly slow to the point where it crashes the tab itself. It just flat out does not work anymore which affects my ability to keep track of time spent on new projects and clients. Customer support has said they are aware and working on the problem but this has been ongoing for at least a month and half, two months. We are very sorry to hear you are having a problem with My Hours. As promised by our support, we are working hard on squashing any bugs in our system. We hope to have this sorted out asap. Comments: Started with trial version, may well upgrade as feature set so far versus price point is fantastic! 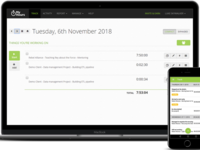 Pros: Ability to set and control all aspects of the hours worked and also customize every logged task makes for an excellent interface and project invoicing tool. Clients are happy with more detailed invoices and clarity about hours expended on their project work. Cons: So far none but have experienced some issues with iOS app, but nothing to detract from overall experience. Cons: Confusing to set up and it is not stable. you must be online to use it, and it crashes unexpectedly. Overall: Confusing to figure out how to link projects, clients and billable hours. Not intuitive. And it has a tendency to get knocked offline while you are using it, rendering it useless. We are truly sorry your experience with My Hours wasn't what you hoped for. We invite you to send us a detailed description of your problems and wishes as we take user feedback very seriously. Our community is an active part of our app development and we are very proud of that. You mention the service is not stable and requires you to be online to use it. We did experience some downtime on the day you posted your review. Unfortunately, our hosting provider decided to shut down the server for unscheduled mantainance. Our response? Start moving to a new, more reliable, best in class cloud hosting solution since we understand that our users trust us with their livelihood and that is no laughing matter. We invite you to give us another try and hope that you will not be left dissapointed this time around. Comments: Pro feature includes invoicing but the feature is not able to email or include detail. detail must be printed out as a separate report to include with the invoice. Otherwise for tracking hours works great! Pros: Easy to add new clients. Easy to track hours or add manually. Reporting is adequate for the task. Free version is a great value. Pros: The web site is easy to use. I especially appreciate the ability to track my projects budget as well as track my consulting hours. Cons: MyTime is still buggy. Some expected functionality still not present such as the ability to view/sort on newly created invoices. Overall: Easy to use hour tracking. Contains most useful reports on hour consumption and billing. We are planning on upgrading how you can work with the invoices as we are aware that area could use some more polish. If you have any other suggestions, please, send them to support@myhours.com. Our team is always grateful for customer feedback! Pros: Very quick to use so doesn't get in the way of work. nice presentation for clients. earns me more money! Cons: It would be a tiny bit faster for me to use if I could add clients and projects at the same time but a very minor issue.